CLICK HERE TO DONATEYour support is so important to ensuring the ongoing availability of Early Life Speech & Language services. 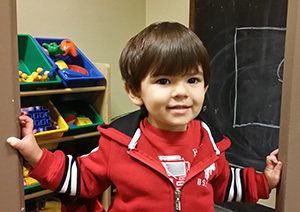 With your help, along with generous support from the Scottish Rite Masons, we can provide individualized speech-language therapy and parent education classes at no charge to families. We are very grateful for your tax-deductible donation! If your employer offers a matching gift program, your charitable donation can make an even bigger impact! Contact your Human Resources department for information on submitting a matching grant request. Make a long-term impact on the communication success of hundreds of young children with speech-language delays. You might consider a gift of stock; including Early Life Speech & Language in your estate plans; and/or establishing a charitable annuity or trust. All of these planned giving opportunities will help us make a real, lasting difference in the lives of so many kids and their families. For more information on planned giving, contact our Director of Development & Communications, Susie Beresford, at (206) 324-6293 or e-mail sberesford@earlylifespeech.org. If you are affiliated with the Masonic organization, you’re invited to become a Children’s Champion. Your donation will grant you entry into the Children’s Champion Club where you will earn recognition within the clinics. For just a minimum of $25 per month, you will earn your membership into the club and earn a branded tie and/or scarf. To learn more, please contact Susie Beresford, at (206)324-6293 or e-mail sberesford@earlylifespeech.org. Making a contribution to Early Life Speech & Learning programs is as easy as…shopping! Make an online purchase of books, shoes, sporting goods, flowers, clothes, pet supplies, electronics and more from your favorite stores through our Merchant Partners link, including Amazon, Kohl’s, Nordstrom, Starbucks, Target and more than 100 top retailers, and a percentage of your purchase goes directly to our organization, with no extra cost to you! If you are a Mason, you can support your Masonic affiliation and the Scottish Rite Masons’ ongoing charitable commitment to providing speech therapy for children with specialized “Helping Kids Speak” license plates. Join the thousands of drivers sporting Masonic license plates who are already on the road! To order your “Helping Kids Speak” vehicle plates, click here. Donate your car, motorcycle, RV, boat or other vehicle and support Early Life Speech & Language. Just think of it as recycling. You’ll not only benefit yourself with a tax-deductible donation, but that car will support the children in your community. To make a donation or learn more, click here and chose Early Life Speech & Language as your Charity. Auto-Donation will pick up your vehicle, auction it off and send the proceeds to Early Life Speech & Language. Click here to see how your contribution can make a life-changing impact on young children with speech-language delays in Washington. Early Life Speech & Language is a nonprofit 501(c)(3) (Federal tax ID number: 91-1239678) and is registered as a Washington State Charity (#4125). Expenses for a year of individualized speech-language services can reach up to $5,000 for a single child. Early Life Speech & Language is able to provide therapy for as long as needed at no cost.